“The venue that it is,” has proved tricky and unpredictable in the extremes and even caught out Scott on a number of occasions, most notably in the opening race when he had a fight on just to finish in 17th place. Since then it has been sublime sailing for the four-time world champion, with just one more race outside the top 10, and seven times in the top three. Even if all the predictions were for him to win, it is still a surprise, even to him, to have managed to achieve it in quite that manner. Even his predecessor, Ben Ainslie, always managed to spin it out to the final moments before claiming victory. Perhaps this is an accurate reflection of Scott’s usually calm and casual style: no stress, no drama, just get the job done in the most efficient way. Vasilij Zbogar’s dream is to end his remarkable Olympic career with a third medal. Vasilij Zbogar (SLO) is the oldest Finn sailor in Rio and will be the oldest in the medal race by some six years. He has felt the demands of Rio on his body more than most of the fleet, but his experience has paid off and he goes into the medal race with an 18 point buffer on fourth place. Perhaps more than anyone else out there, Zbogar is a fighter. He never gives up. He has podiumed in numerous events in the past four years since finishing sixth at London 2012, and the conditions in Rio, while taxing him physically, have suited his sailing style, proven by the fact that he has been first or second overall all week long. Third placed Ivan Kljakovic Gaspic (CRO) is at his third Games and still without a medal. He has won three European Championships and countless medals at other events, but an Olympic medal continued to elude him. Consistency was always going to be key in Rio, and he is in the bronze medal position with only one top-three race result. That is something unusual, though even Zbogar has only finished in the top three in two races. After a reasonably consistent start, Gaspic started to rack up a few top places, more than his main rivals, to put himself into a great position for the medal race. While he will have one eye on silver, he will also have an eye on the sailors very close behind him and challenging for the bronze. One of the sailors who has been notably quiet this week is Josh Junior (NZL). Predicted by many to be a sure fire medal prospect, and perhaps even topple Scott, he has struggled all week, but a late surge now sees him in the medal race and with an outside chance of medalling. Junior is in seventh, 15 points off bronze. A medal is perhaps a bit of a stretch, but not impossible. Of the others in with a chance of the medal, Jorge Zarif is sixth, 11 points from bronze. 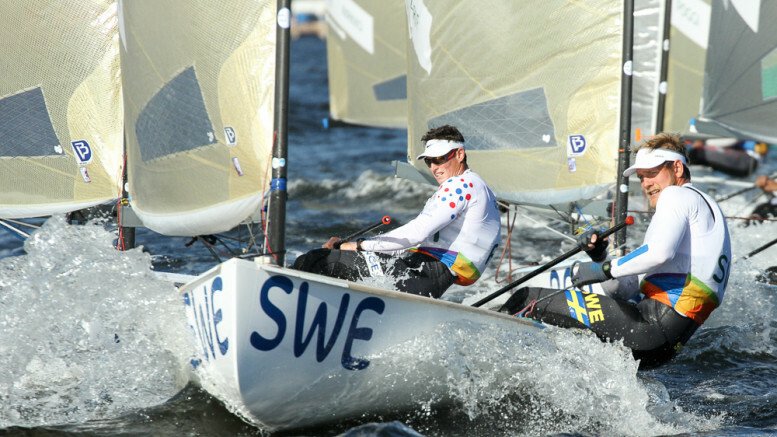 A former world champion, and sailing on his home waters, he has been flummoxed by the conditions as much as his competitors. At the bottom of the top 10, Facundo Olezza (ARG), Pieter-Jan Postma (NED) and Jake Lilley (AUS) are all 18 points off bronze. While mathematically possible, a medal is pretty unlikely. We will finish with some more words from Giles Scott. He has been through a lot to get to this point and in the eyes of the fleet deserves this medal more than most. His elation, and relief, is palpable, a testimony to the hard hours that have preceded an amazing victory.